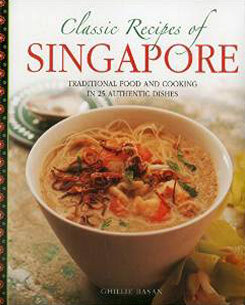 This title presents traditional food and cooking in 25 authentic dishes. You can discover the essence of this exotic cuisine with 25 classic recipes presented in a stylish gift book. You can explore the wide range of fresh and vibrant ingredients in more than 25 recipes, ranging from the classics such as Singapore Chilli Crab and Chicken Satay, to lesser well-known but equally tasty dishes like Hokkein Prawn Noodle Soup and Winter Melon Pachadi. The introduction offers a concise overview of this exciting culinary tradition, plus a guide to the main ingredients of the country. It is illustrated with wonderful photographs by William Lingwood of practical steps and final dishes. Food is an important part of the culture in Singapore. Everywhere you go there is something to eat and wherever you look there are people eating. Rich in traditions, the food and cooking of Singapore is greatly influenced by its multicultural population, resulting in many gastronomical delights. This attractive book brings together a fusion of the Chinese, Malay and Indian ingredients that define Singaporean cuisine. There are fried and grilled street snacks, light and fragrant noodle dishes, hot and spicy shellfish dinners, succulent meat broths, fresh side salads and wonderful sweet desserts to try. Packed with beautiful photography, step-by-step recipe instructions, cook’s tips, variations and nutritional information for each recipe, this attractive recipe book is a must for anyone interested in learning about this fascinating cuisine.